I've noticed a lot of searches for Zoya swatches on here for the past few hours... They must be having a special! 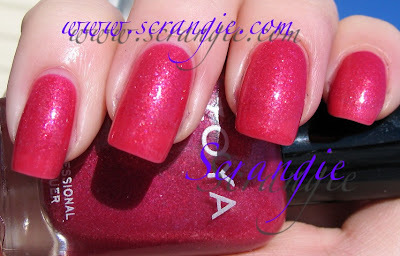 Hi, I just came across your blog while looking for new OPI and Essie colors to purchase for the fall. I loove all the swatches that you put up. I just wanted to know, how do you apply your nail polish so perfectly? I do my nails all the time and they look pretty good since I get compliments, but I'm OCD about trying to get them perfect. Yours look like they're done professionally all the time. Thanks! hahaha scrangie, you're so amazing!!! *sigh* you realise that thanks to you my Zoya wishlist has now tripled in size. It's tough being me! I like a lot of Zoya's colors but their formula leaves a lot to be desired. I've thinned 5 of the ones I have because they are just too thick to put on for me. Thanks a lot, I'm looking too to buy some Zoya. You convince me. Hi! I haven't been any good at giving you comments, but oh my gooood how much I've been here to get some help when to decide witch polish to buy! The time has come to give you some credit for all the amazing swatches you have showen. Not only are the pictures lovely to look at (and gives me some serious carvings too) but you write very nice texts that is entertaining too. Tonight I will maken an order for a bunch of China Glazes and you have been most helpful with all beautiful swatches when I decided wich one to buy. Thank you so much. Guilty! 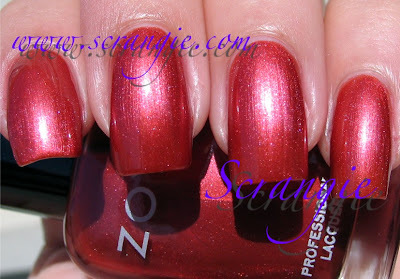 I was checking out your gorgeous swatches of Zoya's Winter Matte Velvets! I have only one question: how on earth do you make such a perfect application next to cuticles, eigh? I couldn't even being to tell you what a help this blog has been to me when going on my "spending my entire paycheck on nail polish" blurs! These Zoya swatches are all so gorgeous! By the way, I've tagged you! Check out this post for details. Lots of gorgeous colors. Don't make me order more Zoya. I did much damage to my wallet a few weeks ago. Thanks Scrangie, I love your nails, you make me wanna buy all the colors, they look so perfect. I like Zoya, but with them going up to $7 and OPI, Orly, Misa, and China Glaze for $5 or less at Trans Design, it's not looking as good as it used to. Now to add to my wishlist: Anastasia, Evangeline, Harmonie and Irene. I am convinced I need every color they make almost LOL. I probably have a dozen (Zoya's alone) on my wishlist. Oh and btw you are to blame with your beautiful swatches!